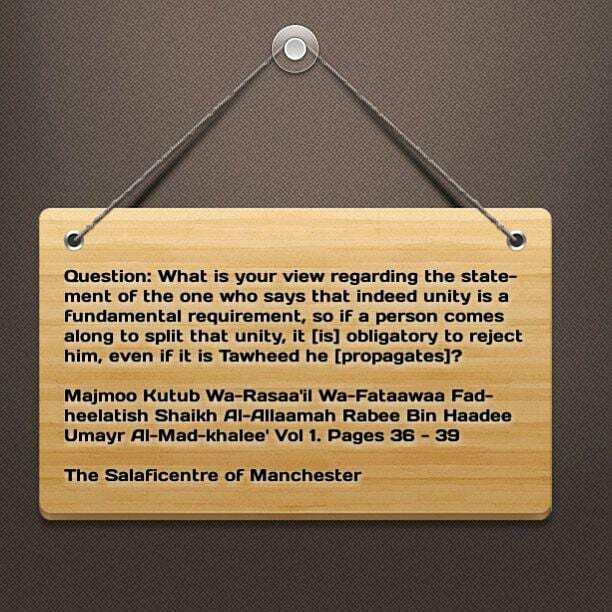 Question: What is your view regarding the statement of the one who says that indeed unity is a fundamental requirement, so if a person comes along to split that unity, it [is] obligatory to reject him, even if it is Tawheed he [propagates]? What is the Rope of Allaah? It is the Qur’aan and [authentic] Sunnah; therefore the bond of Tawheed between you has to be the Book of Allaah. Allaah [The Most High] said:[ إِنَّ هَٰذِهِ أُمَّتُكُمْ أُمَّةً وَاحِدَةً وَأَنَا رَبُّكُمْ فَاعْبُدُونِ – Truly! This, your Ummah is one Ummah, and I am your Lord, therefore worship Me [Alone]. [Surah Al-Anbiyaa’ Aayah 92] This is the unity that Allaah wants- [unity] upon truth and the revelation Allaah- and obligated on us. The sound Dawah [necessitates] that we unite the people upon the Book of Allaah and the [authentic] Sunnah of Allaah’s Messenger [sallal laahu alayhi wasallam], so whoever responds will enter – InshaaAllaah- in the shelter of the saved sect and victorious group, and whoever refuses, then indeed he has chosen to be from the destroyed sects- those whom Allaah’s Messenger [sallal laahu alayhi wasallam] informed us about; because they [i.e. these sects] refuse to unite under the banner of Tawheed, the Qur’aan and the [authentic] Sunnah, therefore they follow nothing else but the paths which the devils amongst mankind and Jinn call to [Ref 1], and Allaah has not burdened any soul beyond what it can bear. At present, we experience the end results of these Da’waat [i.e. calls of the deviated sects] on the face of the earth! What is taking place at present in Afghanistan between the people of these calls? What took place after Kabul was liberated [i.e. from the Russians]? Did the people of these calls not start to quarrel and kill one another for sake of position! At present we’ve seen divisions [amongst the groups], except the Dawah of the Imaam – The Mujaddid – Muhammad Bin Abdil Wahhaab [rahimahullaah]. 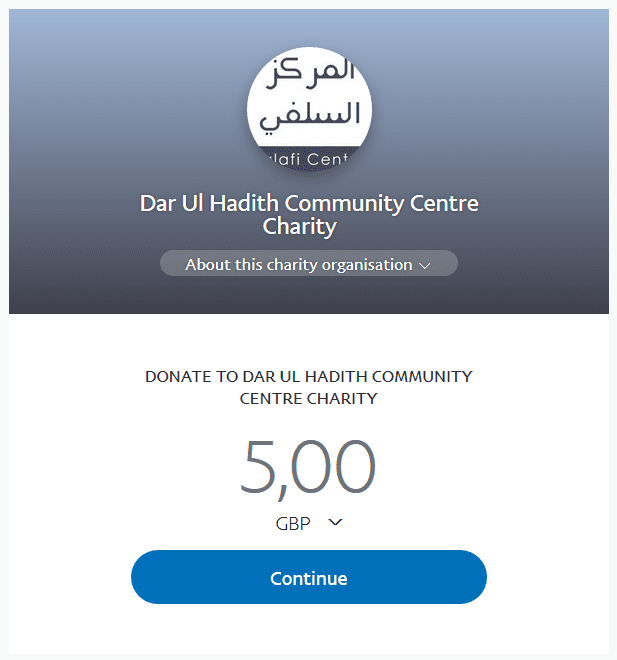 The [upright] scholars of this Dawah have not differed up to this era – no differing in Manhaj, Aqeedah or politics has occurred between them, because indeed it is a Dawah based on: “Allaah said and Allaah’s Messenger [sallal laahu alayhi wasallam] said”, however others besides them have become [divergent] groups – Jamaa’atut Takfeer [i.e. the Takfeeri Group], Jamaa’atul Jihaad [i.e. the Jihaadi Takfeeris], groups based on splitting and schism, [the emergence] of group after group, without an end…and one cannot find anything to protect them from splitting, [because] that which will protect [this Ummah] from splitting is the Qur’aan [i.e. sound understanding of the Qur’aan based on the understanding of the Sahaabah] and unity upon that. This is why the affair of the sincere ones has been prolonged and amongst those sincere ones are the people upon the Da’wah of Imaam Muhammad Bin Abdil Wahhaab [rahimahullaah], and you will find the [upright] scholars of this Da’wah upon [true and sound] brotherhood- neither differing in Methodology and Creed nor does politics [i.e. innovated political activity] exist amongst them.